The book propelled Bego into the talk radio circuit, an arena where he serves as a voice of anti-compulsory unionism. In 2012, he published an update, "The Devil At Our Doorstep." 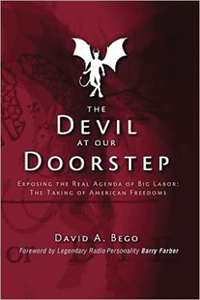 Bego has appeared as a guest on various radio and TV programs, including with Lou Dobbs on the Fox Business Network, and as a speaker for organizations such as The Heritage Foundation. These days, Bego is happy to put the SEIU attack on the backburner. Back at EMS headquarters, Bego leans thoughtfully in his maroon leather office chair. Around the perimeter of his office are shelves lined with business books, sports memorabilia and family photos. Though he continues to contribute to the political discourse surrounding compulsory unionism, Bego has kept his focus on the business. He spends his free time with family, and often hits the green at his childhood golf course, Maple Creek Golf & Country Club — a property he purchased. In a sense, Bego has returned to living The American Dream, albeit cautiously.